A group photo featuring members of the Mongolian and Hokkaido University delegations., including Mongolian Prime Minister Ukhnaagiin Khürelsükh (4th from left, front), Mongolian Ambassador to Japan Dambadarjaa Batjargal (3rd from left, front), Japanese Ambassador to Mongolia Masato Takaoka (3rd from right, front) and Hokkaido University Executive Vice President Masanori Kasahara (4th from right, front). Mongolian Prime Minister Ukhnaagiin Khürelsükh and a delegation of 15 Mongolian government officials visited Hokkaido University on Friday, December 14th, as part of their 3-day official state visit to Japan. The Prime Minister and the delegation, accompanied by Japanese Ambassador to Mongolia Masato Takaoka and Mongolian Ambassador to Japan Dambadarjaa Batjargal, met with top university officials, including Executive Vice President Masanori Kasahara. The visit was intended to commemorate and recognize the academic exchanges between Hokkaido University and Mongolian institutions of higher education, which have been ongoing since 2009. Prime Minister Khürelsükh and the Mongolian delegation arrived at the university during a heavy snowstorm and had lunch with the Hokkaido University representatives before moving to the Creative Research Institution (CRI) facility in north campus. 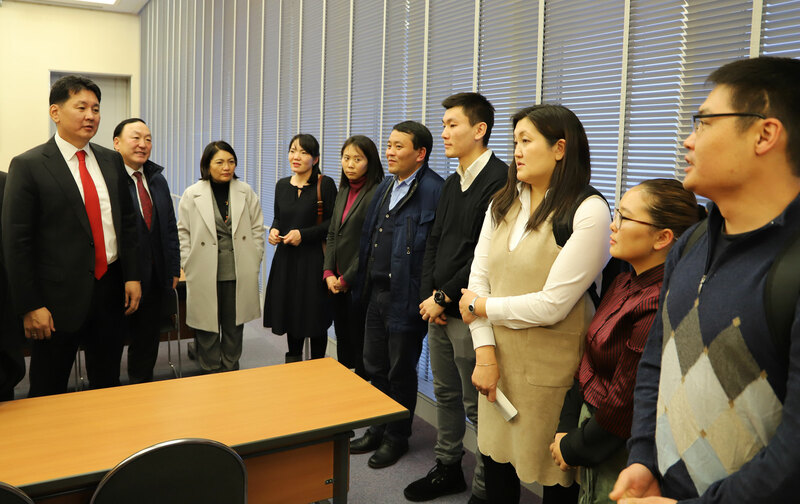 At the CRI, the Prime Minister and delegation members greeted Mongolian students and staff members, and also heard lectures describing the research Mongolian students and staff are engaged in at Hokkaido University. Following the lectures, Prime Minster Khürelsükh spoke to the attendees, expressing admiration and encouragement for their research and gratitude at the ongoing exchange activities between Hokkaido University, the Mongolian University of Life Sciences, and the National University of Mongolia. Prime Minister Khürelsükh greeting a group of Hokkaido University Mongolian students and staff. 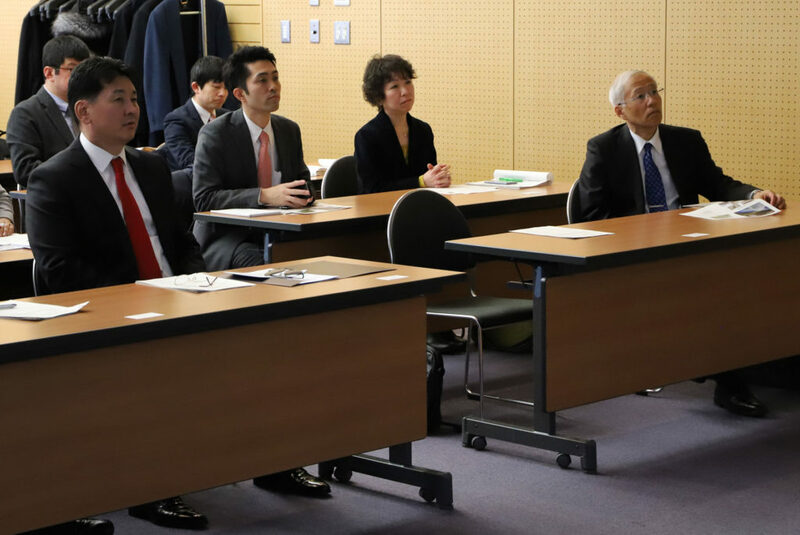 The Prime Minister and Hokkaido University Executive Vice President Masanori Kasahara attend the lecture session. During the last segment of his visit, Prime Minister Khürelsükh undertook a facility tour of the Space Mission Center at the university. Dr. Kurihara and Ph.D. candidate Begzsuren Tumendemberel introduced and explained to the Prime Minister different technologies and features used in the camera of the DIWATA microsatellite, a joint project conducted by Hokkaido University, Tohoku University, and the governments of several southeast Asian nations. During both the facility tour and the lecture portion, Dr. Kurihara mentioned the possibility of collaborating with the Mongolian government on similar projects in the future. 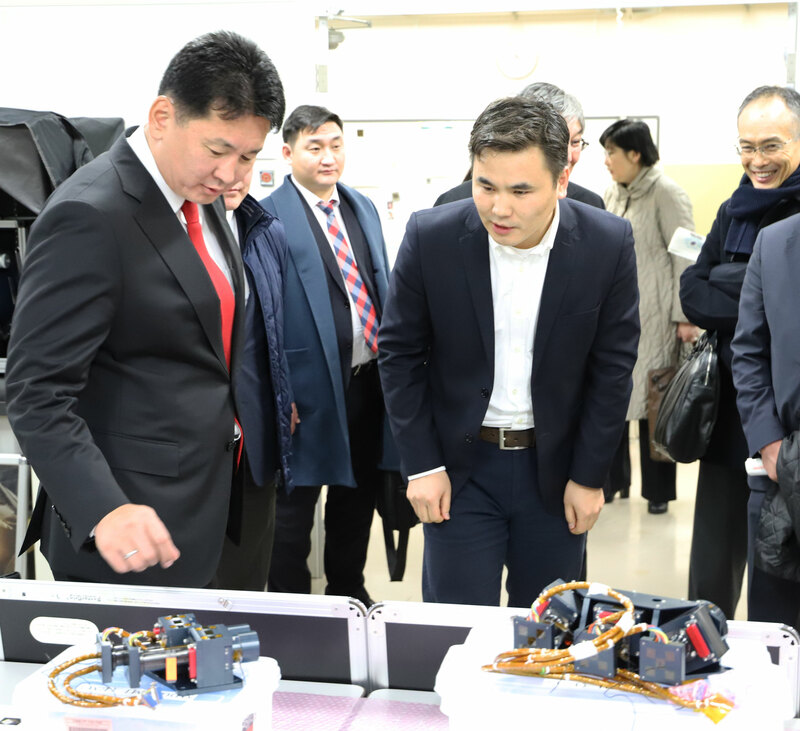 Hokkaido University Ph.D. candidate Begzsuren Tumendembere (right), explains different features of the DIWATA microsatellite camera system to the Prime Minister (left).